What makes Colorado such a haven for skiers and snowboarders from around the world? With 54 peaks over 13,500 feet high, there's no shortage of terrain. Colorado also offers clear days and breathtaking natural scenery that attracts everyone from celebrities to local families looking for a weekend getaway. Here are the state's five best ski resorts, where you can experience the best winter magic. Located 100 miles west of Denver, Vail is North America's third-largest ski resort, with over 5,000 acres of terrain. The slopes sit above the upscale town of Vail, with its boutiques, restaurants, and luxury hotels. 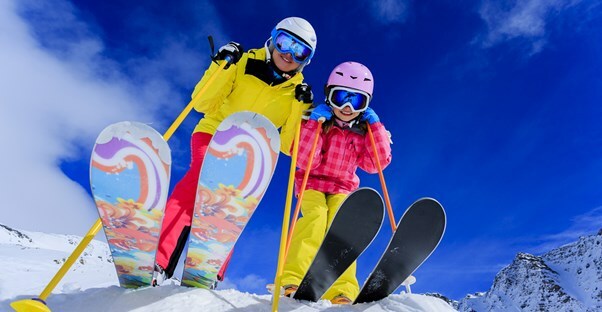 With four zones and three base villages for skiing (Golden Peak, Vail Village, and Lionshead Village) you'll have fun if you're a beginner, intermediate, or expert. Plus, you can stay anywhere from the Vail Marriott to a tiny bed and breakfast. Arguably the most famous skiing region in Colorado, Aspen and its sister town, Snowmass Village, are home to four different mountains. While Aspen is usually associated with the rich and famous, the town offers shopping and dining opportunities for travelers of every budget. Still, the luxury hotels are impressive. The Little Nell is popular with celebrities and runs a pop-up champagne bar on the slopes, and Hotel Jerome dates back to 1889. In the western part of the state, Powderhorn is a 45-minute drive from Grand Junction. While most ski resorts are in mountainous areas, Powderhorn is unique because it sits on the side of one of the largest mesas in the world. Because the dry climate produces plenty of powdery snow, the resort caters to beginner and intermediate skiers. The sunny, family-friendly area is known for its affordability and proximity to all Grand Junction has to offer. Located in the heart of the San Juan National Forest, this resort is known for its amazing views. Voted one of the best mountains to ski with your kids, Durango is still known by many locals by its former name, Purgatory, which is also the name of its famous zipline. The resort itself is home to festivals and recreational activities all year long, and it's just 25 miles from the city of Durango, with its many lodging and dining selections. Over two hours from Colorado Springs, Breckenridge Resort sits above the town of Breckenridge and is one of the most visited ski spots in the Western Hemisphere. The popularity of "Breck" is often attributed to its famously friendly and welcoming locals, but there are also five peaks and nearly 3,000 acres of ski terrain. Breckenridge itself is an authentic mining town with a hip, laid-back vibe, and it makes a one-of-a-kind vacation destination. With over 300 days of sunshine per year, it's little wonder that Colorado is such a world-renowned skiing region. If you are planning to hit the slopes, all four corners of the state have viable and exciting options.